Though they were genuinely outplayed by the Cavaliers in the final three games, it became increasingly clear that the Warriors weren’t playing with their full deck of cards. In particular, Stephen Curry was not the same unanimous MVP player the wowed the NBA world in the regular season. Many people felt he simply wasn’t healthy after spraining his MCL in the first round of the playoffs. Though he returned in the second round and played well sporadically, he notably lost his trademark shiftiness with the ball. After the injury, Curry struggled with side-to-side movement, particularly on the perimeter where he couldn’t lose and punish opponents. This seemed most evident on the biggest possession of the Finals. After Kyrie Irving hit what proved to be the game-winning three-pointer, Curry came down the other way and got Kevin Love on a mismatch. Love, a slow-footed big man, normally wouldn’t have a chance at staying with Curry. And though Love did an excellent job trying to stay attached to Steph on the perimeter, the Stephen Curry from the regular season likely could have shook Love quickly. 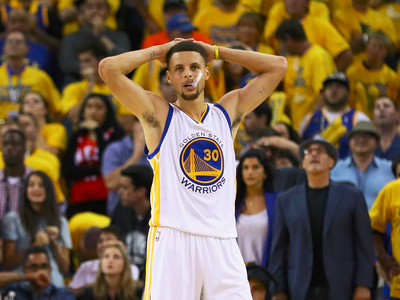 Instead, Curry couldn’t find the airspace, then forced a bad three-pointer and missed. Again, Love should be commended for playing excellent defence, perhaps the defence of his life. But Curry simply couldn’t get the separation he needed. The miss was essentially the dagger for the Warriors. After the game, Curry continued to wave off the notion that the injury bothered him. Curry said if he was healthy enough to be on the floor, that’s all that matters. However, he did acknowledge that on that play, he should have taken it to the basket instead of hunting for a three-pointer. Players on both teams are quick to point out that nobody is completely healthy come June. The Cavs won the championship with an incredible comeback, but it’s also fair to question if they got Curry’s best shot in the series.